So many things to craft, so little time. Your kids will enjoy this Minecraft style cube activity. 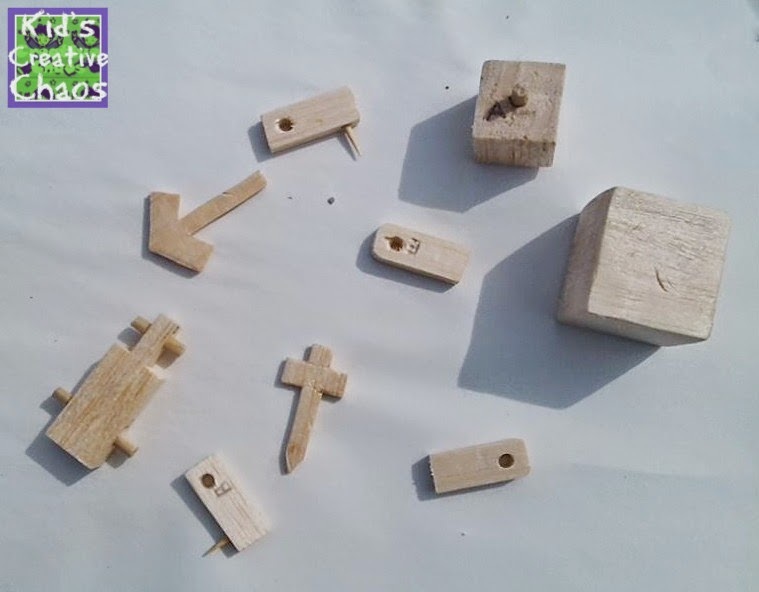 Make your own Minecraft Figure with Balsa wood scraps you can find at Michael's or Hobby Lobby. Find the How to Tutorial below or send us an email, and we'll send you a handmade kit for $2.50 plus shipping. Scroll to the bottom for Minecraft party snacks and free Minecraft printables. Enjoy! 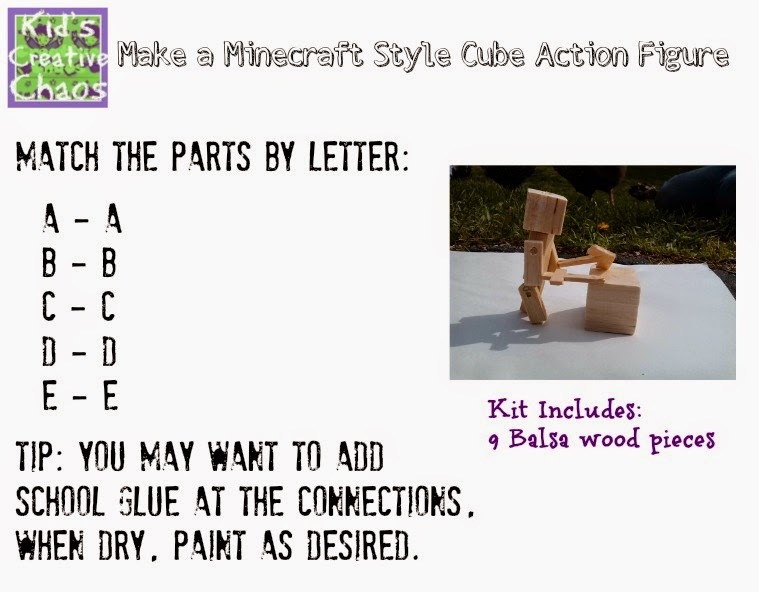 Make your own Minecraft style cube man from Balsa wood. Please note the word handmade, no two are exactly alike, and you may want to sand your cube man before painting him. I bet you'll want to call him Steve! You must have a Paypal account to place an order. How to make your own Minecraft style puzzle. Minecraft style Balsa wood cube man puzzle kit. Feel free to call him Steve. First, you will need to purchase some Balsa wood. Amazon offers this grab bag Balsa Wood Economy Scrap Bag . These are similar to what we used to make our block puzzles. The pieces aren't perfect. You will need to carve the shapes as pictured above and then sand the shapes. We used dowels at the joints to make a permanent connection. Balsa is easy to cut and trim. You don't need fancy wood carving tools, a simple X-ACTO knife will do. Once sanded and glued, it is time to paint your Minecraft style action figure. Just like in the Minecraft game, you can let your creativity run wild only now you are working at a real crafting table and making lasting memories. 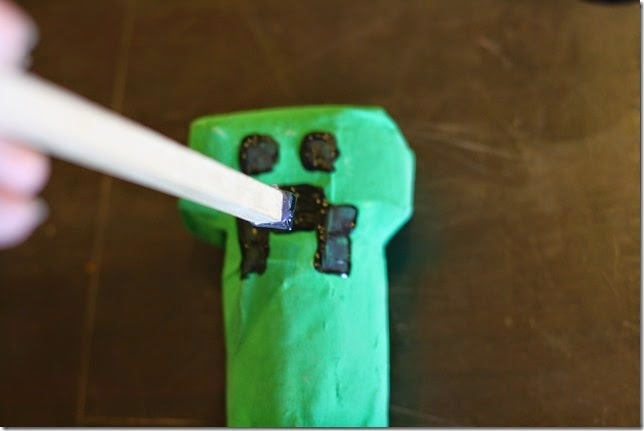 Royal Baloo has Free Minecraft Printables and this very cool Minecraft Creeper Paper Mache activity.